Yes, MomGoth was a scofflaw in her college days; I confess it. 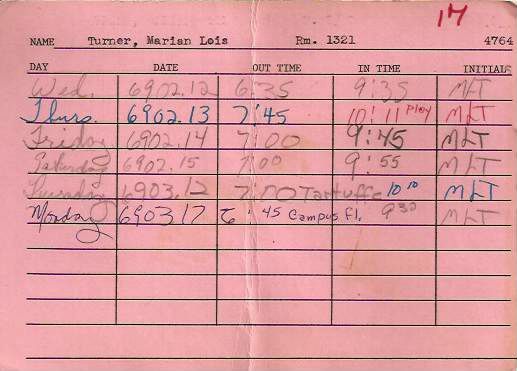 See, all the female dorm residents were required to fill out these cards after, say, 6:00 pm. I’m sure, now, the purpose was to keep us safe, but the male residents didn’t have to fill them out, so we saw it as sexist. If it had been merely paternalistic, the boys would have had to fill them out, too, yes? I see we were also supposed to note where we were planning to go, and that my destination, when I chose to share it, was often a play or the campus flick. Nothing to bring the blush of shame to me, but it was the double standard that irked me. Truth be told, that’s about as protesty and scofflawish as I ever got. Kinda sad, isn’t it? A WRITING PROMPT FOR YOU: A character outrages a rule or breaks a forced agreement. This entry was posted in Throwback Thursday. Tagged college life, memories. It’s exactly like my medical hostel days! Feeling a little nostalgic! At UofL, where I attended a while, there was a rule about girls having to wear skirts whenever entering the Admin Bldg. Well, skirts were VERY short then, and it was a hard winter. This ‘rule’ didn’t last past November, however long ago it had held in the dark past! Crazy days. I can remember young women being made to kneel; if their skirts didn’t reach the floor in that position, they had to leave school.